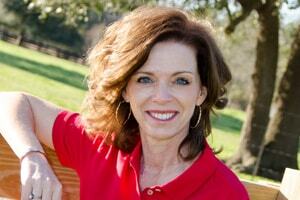 Linda Emanuel has many roles – RN, Ag Producer, and AgriSafe Community Health Nurse. She is one of UMASH’s partners who know how to walk the walk when it comes to agriculture safety and health. She has a particular interest in female farmers and works to highlight the unique safety concerns in her work with AgriSafe. Read this spotlight story to learn more about the many resources AgriSafe has available for farmers of all ages to improve their safety and health. With boots on the ground, female farmers take pride working to produce food, fiber and fuel for the world. They face unique environmental exposures, ergonomic challenges and health disparities across the age continuum. AgriSafe is founded on the idea that all agricultural producers deserve access to health information and health care from providers who understand farming and ranching. AgriSafe is the Go to Source for navigating a journey of good health. The Yoga and Pilates Guides are designed with women in mind. Both forms of exercise are designed to lengthen, strengthen and stretch all the major muscle groups in a balanced fashion. Pilates is known to improve flexibility, strength, balance and body awareness. While yoga brings the body and mind together, through three main elements of exercise, breathing and meditation. The stretches and postures demonstrated can be done in the middle of your work, incorporating tools and locations commonly found on a farm or ranch. 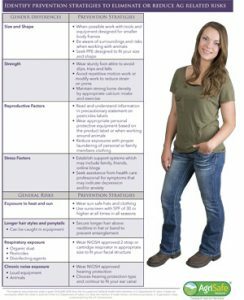 AgriSafe has developed a health risk appraisal just for farm women that evaluates farm exposures and guides the female farmer through simple steps to prevent illness and injury. As Ag producers, we have complicated jobs with a diversity of exposures. How often do we educate ourselves on occupational health risks? AgriSafe’s simple fact sheet highlights key points to help you focus on yourself and solutions to stay well. It’s free to access and to share. The major focus of the program is on the identification of and the safe usage of chemicals and pesticides, along with proper use of respiratory protection. Farm women face unique challenges because machinery is not made for the size of females and women have decreased level of bone density as they age. This program is intended to prevent ergonomic issues that can lead to farm related musculoskeletal injuries. Pregnancy and fertility are often not considered when women assume farm work. 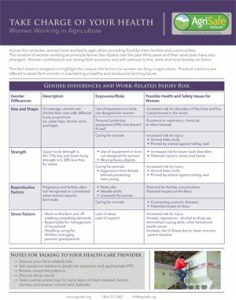 Learn how to prevent reproductive risks caused by chemical exposures, zoonotic diseases and heavy lifting. Take some time in 2019 to share your story with AgriSafe. Our purpose is to collect and share stories of life changing medical events experienced by farm women. We believe their stories can inspire and bring hope to others. Submitting a story is easy – just click the link below to answer a few brief questions.